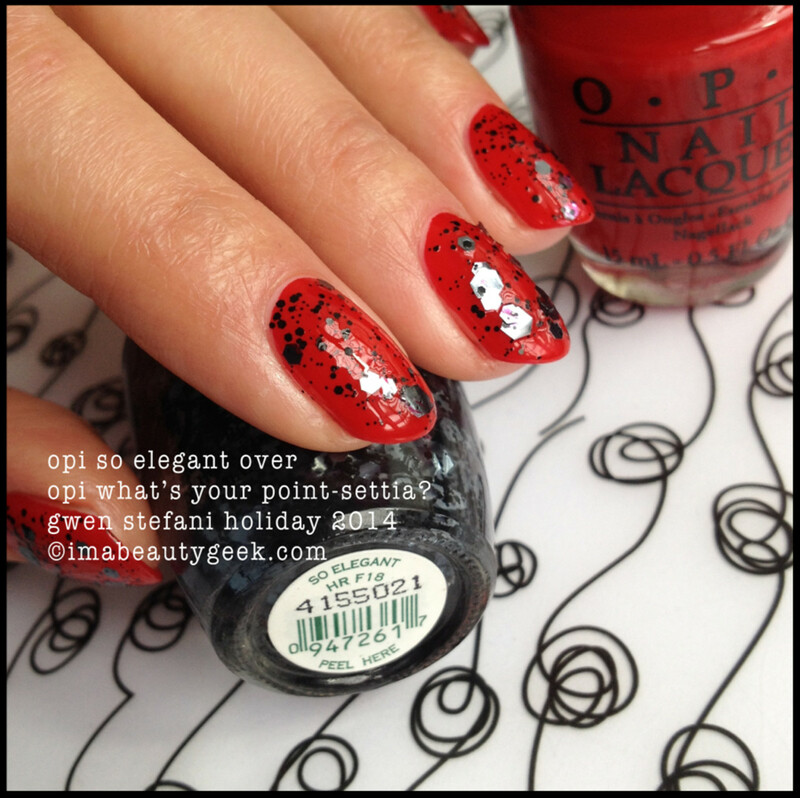 The OPI Gwen Stefani Holiday 2014 collection is almost here (and has actually landed in some places). It’s big. 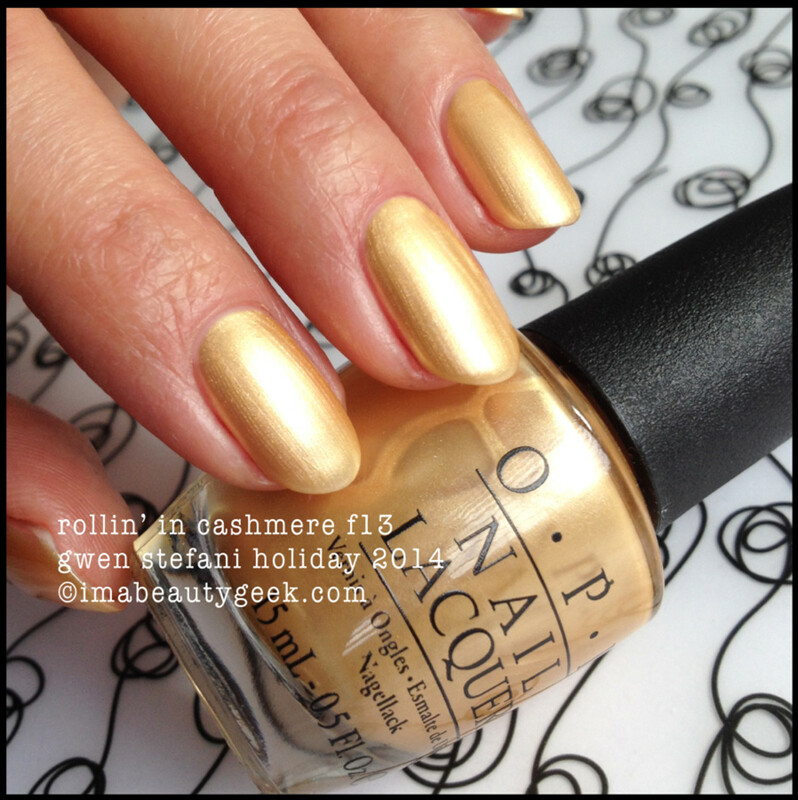 We’re talking about 12 shades of polish, 6 limited edition glitter top coats, and one super spectacular 18k gold top coat to round the whole OPI Gwen Holiday palette out. Enough chit chat! You know what comes next, right? Prepare to go blind. 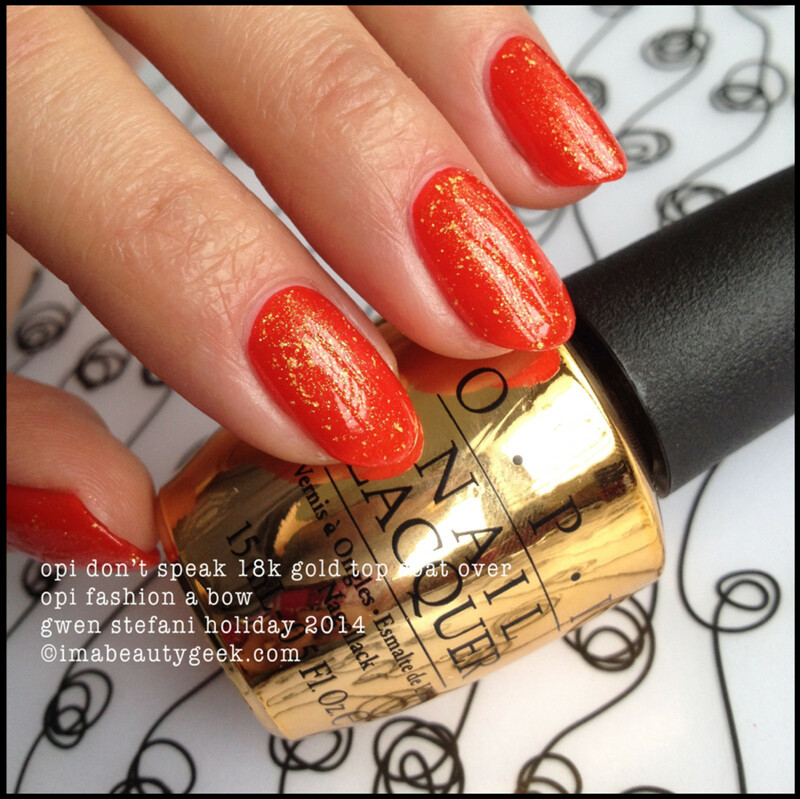 opi gwen stefani holiday = wrap it up! So let’s crack on and check out some of the big reds for holiday, yes? I’ma stick all the glitter coats in here and there and slap up lotsa pictures from a couple different angles so you can see what a change in light does to the polish shade. Sometimes the difference is subtle and sometimes all it does is help show you the shimmer. Ready? 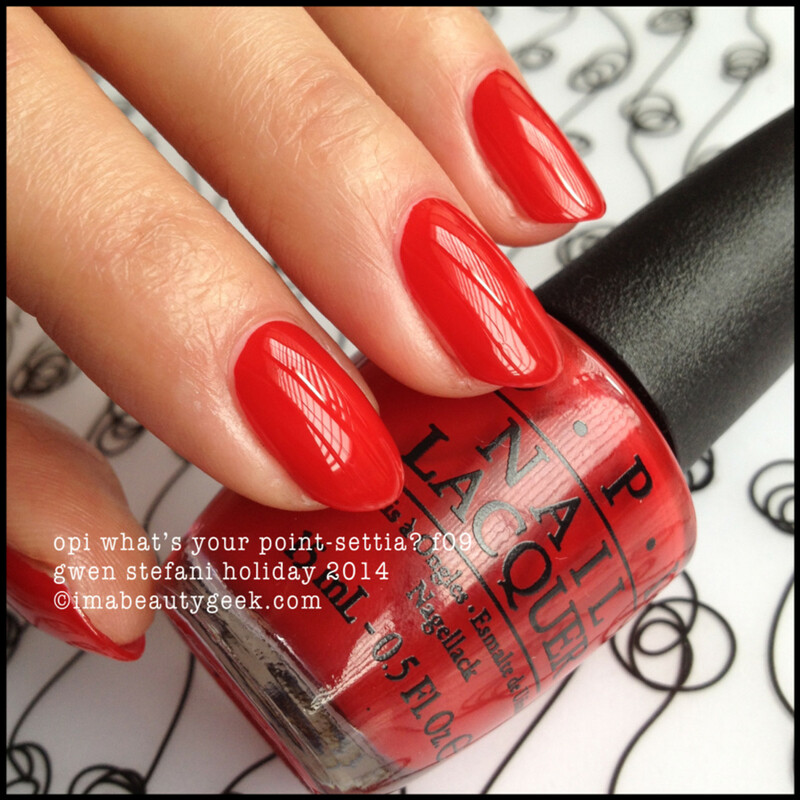 opi gwen stefani holiday 2014: what’s your point-settia? Oooh! 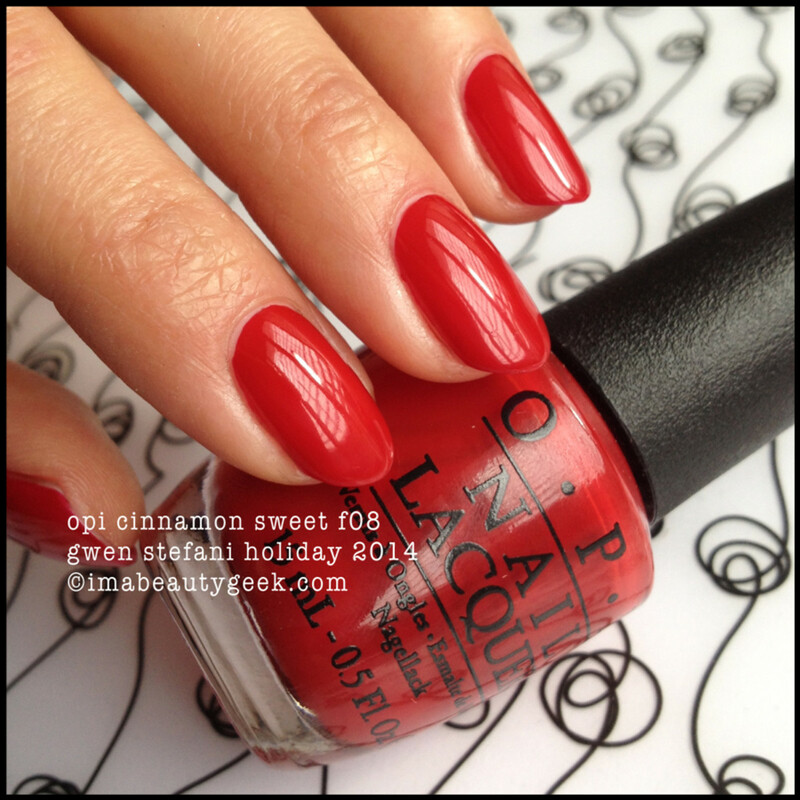 Poppy red that’s a OCW!!! I love a OCW! and I love a poppy red so you know that right now, I’m smiling. 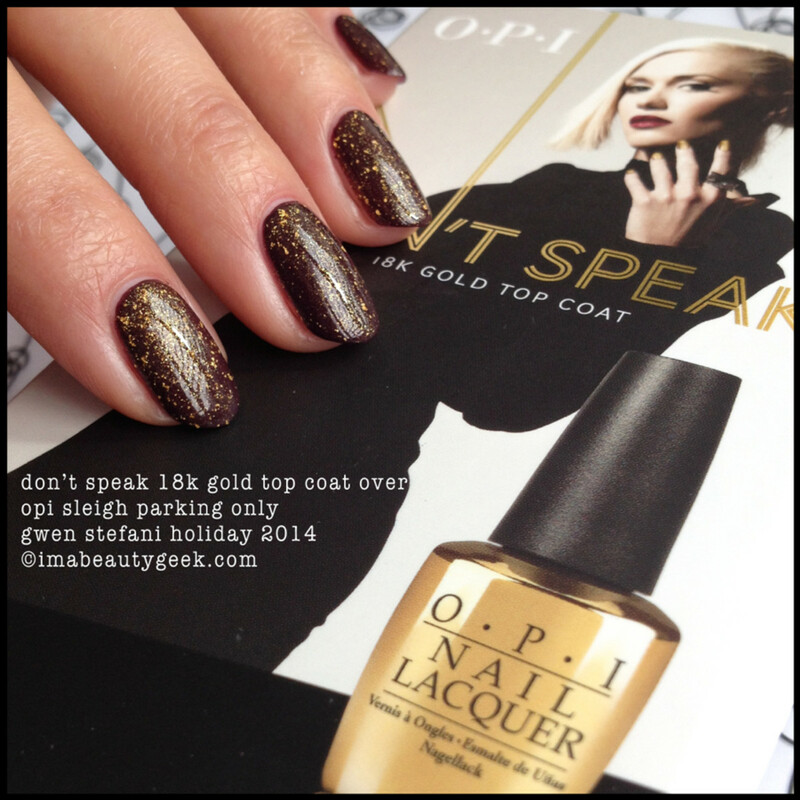 opi gwen stefani holiday 2014: so elegant over what’s your point-settia? Hmm.. I didn’t get a particularly good distribution of those big fat hex glitter bits. I think perhaps my technique needs work or those silver hex things needa be smaller. It’s pretty though – and festive. 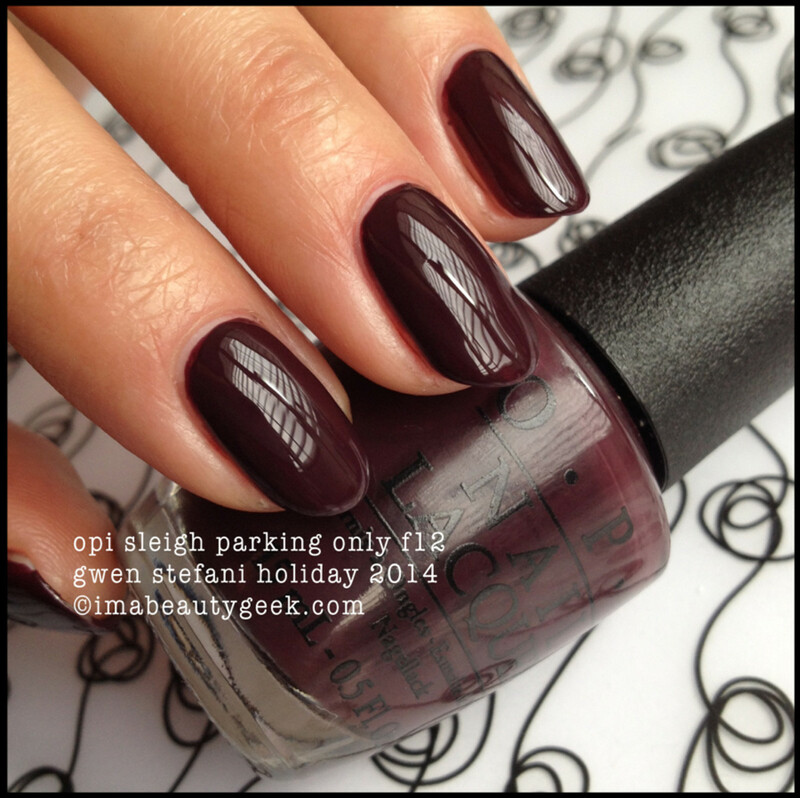 opi gwen stefani holiday 2014: so elegant over what’s your point-settia? . Wait. If that other one was poppy, what’s this one? I’m gonna call this classic red because that’s what it is. Also, it’s a OCW!!!! Woot! I love that! 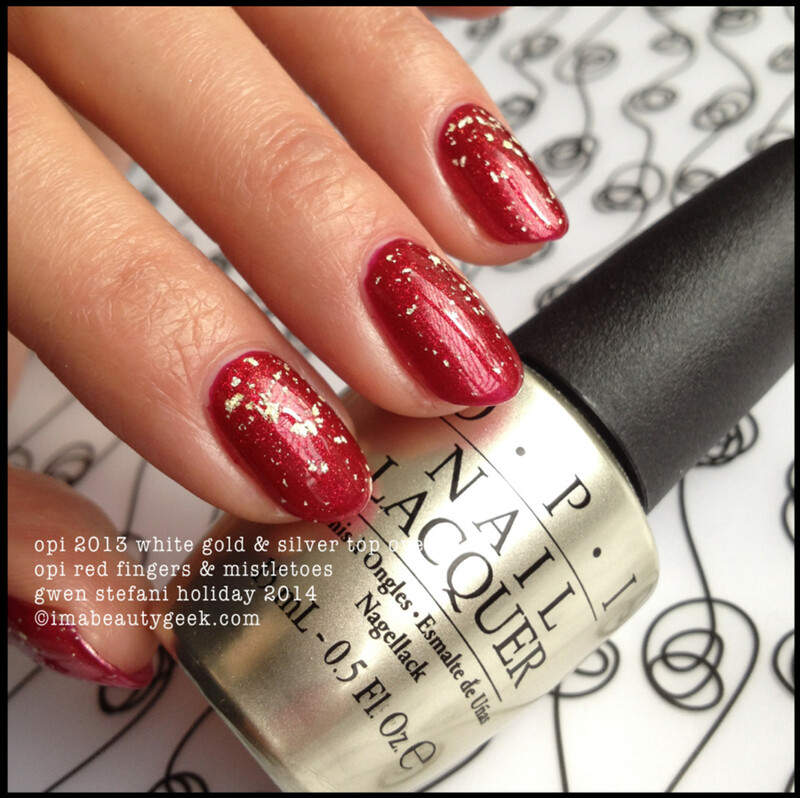 opi gwen stefani holiday 2014: snow globetrotter over cinnamon sweet. 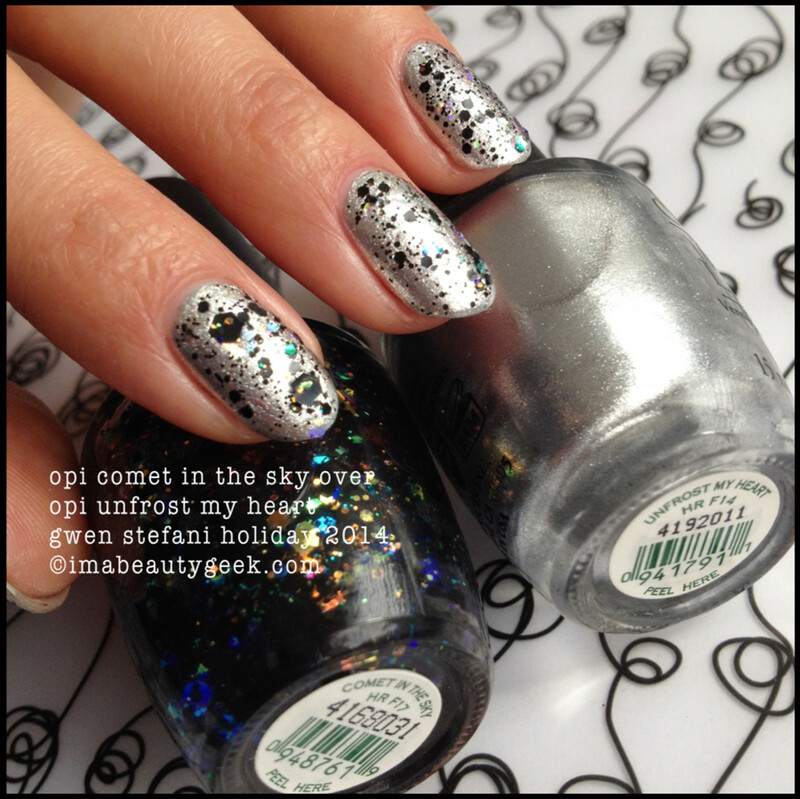 And here’s another one of those limited edition OPI Gwen Stefani glitter coats. You know what’s in there? Super-light prism reflector hex glitter bits! What the heck am I talking about? Well you see that middle finger? You see that big blue-ish sorta glitter bit? Well it relects light and depending on the angle of viewing, it can look blue or yellow or rainbow-y. Neat, right? Ah. There it is. The perfect holiday red – the one with a good shot of blue in it to warm it all up. But this is a jelly sorta red. She’s thin (note the little dribble that’s flooded into the cuticle of middle finger) but she builds easily in two coats. Don’t overload your brush or it’ll be Flood City. Trust me on that, k? From this angle she doesn’t look as warm but she’s still beautifully holiday. Bar glitter? Sqare glitter? Dot glitter? Okay! It’s festivus maximus all up in here! That’s a single coat of the limited edition top coat – I loaded up one side of the brush, wiped the other side off on the bottle neck, and slapped the blob side down and did a push-‘n-pull to move it around and get even coverage. Sounds tricky but really, so easy. Oh look, more red. Wait. No. It’s burgundy. Or burgundy-ish. Or maybe we can call it merlot. Or beet. Or hey! Maroon! Call it whatever you want but if there isn’t a red in this collection to suit you, I’ll eat my entire family-size bag of Cheetos in one sitting. It’s just an awesomesauce shade of reddish-orange. I can’t handle my love for this shade. Gah! Too good! And it’s a OCW?? Get out! But wait. Seriously? How much do you love this? Gimme that. I don’t care how much it costs. Give it to me. One more time because I can. One coat of this over one coat of that and lookit. Need I say more? Super-light-reflector-iridescent-glitter bits! Wheeee!! I know they have a name and someone out there can fill me in but for now, I’m just gonna sit here and swoon over this kinda stupendous glitter coat. Yes, it reminds me of OPI Warm Me Up. Yes, it reminds me of OPI Queen of the Road but I don’t care. I adore this kind of shimmery charcoal espresso a lot. Yes, shimmery. Yes, stunning. If you make that zoomy-zoom, you’ll see the shimmery-ness where the light hits it. Beauty. Sometimes I do things with glitter than I’m not quite sure about. I really can’t decide if I like this or not. It’s interesting but I don’t quite think it’s for me. Your thoughts? Ha! My label says Christmas Gone Paid. Best! But let’s not focus on that. Let’s focus on this mesmerizing shade of deep forest green that’s actually green and not black. Seriously, you can’t get much deeper green than this and still have it show green. Did it stain my cuticles? You betcha. Was it worth it? You betcha! Why? Come on! How freakin’ great is this combo? When I look at it, I see a snowglobe with those little tiny trees in it and I’m shakin’ the crap out of it to make it snow inside there like a blizzard. I love.love.love this – it screams holiday all over the place. This reminds me of something but I can’t quite put my finger on it. Don’t care right now though because I’m sort of too busy swooning. It’s like a really good grape with these golden flecks stuffed in it and when you slap your two easy coats on, it’s almost like the gold just sits right underneath the surface and makes it all crazy kinds of appealing. New Year’s Eve anyone? See that gold fleck in the bottom of the bottle there – it translates to the nail remarkably well. In my estimation, this right here is a stand-out shade. Oh look… a blackened burgundy. Yawn. But wait! Just wait!! Aren’t you glad you waited. Ha! I made that and you can too. All you need is one coat of the gold go-juice and one coat of sleigh parking and Ta Da! Smashing! I love purple polish and I don’t care who knows it. And a purple like this? Gimmie. Here in this shot it pretty much looks like a regular royal purple, right? Maybe you can see a touch of shimmer where the light hits it but prolly not. And then, right around where the artificial light hits it, lookit that shimmery happiness that’s hiding in there! I can see it over here because my image isn’t compressed by the magic that is the internet so if you wanna see it over on your side of the screen, zoomy-zoom. It’s subtle and it’s lovely and errrybody who loves a royal purple is gonna buy this – bet on it. Oh hey, a satin-finish chrome-esque golden thing. 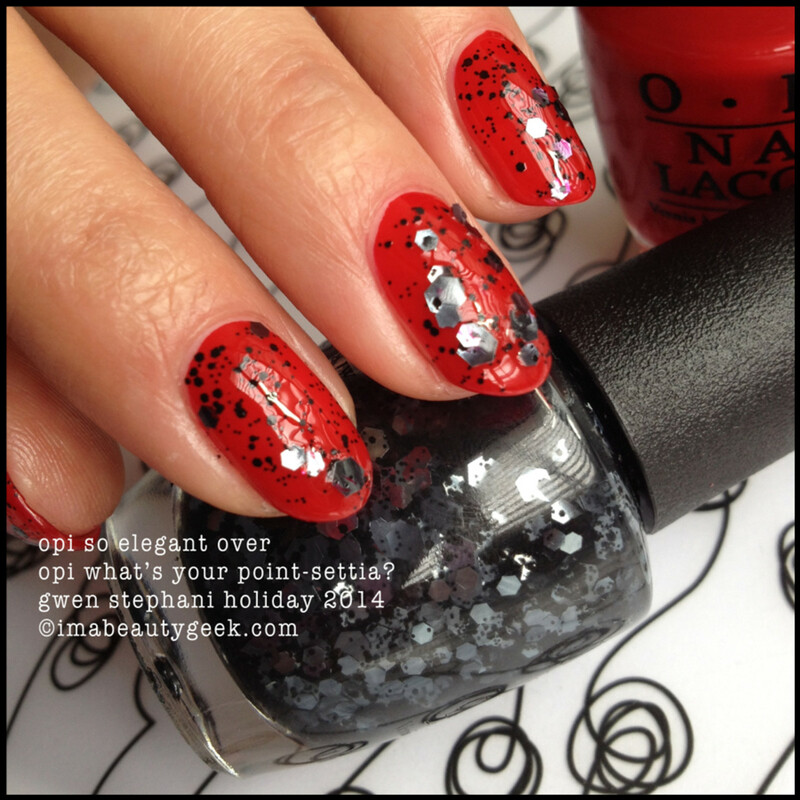 Sorta conjures up memories of OPI 50 Years of Style from the was-just-released Mustang Collection, right? Yeah... let’s just say 98% dupe-tastical. 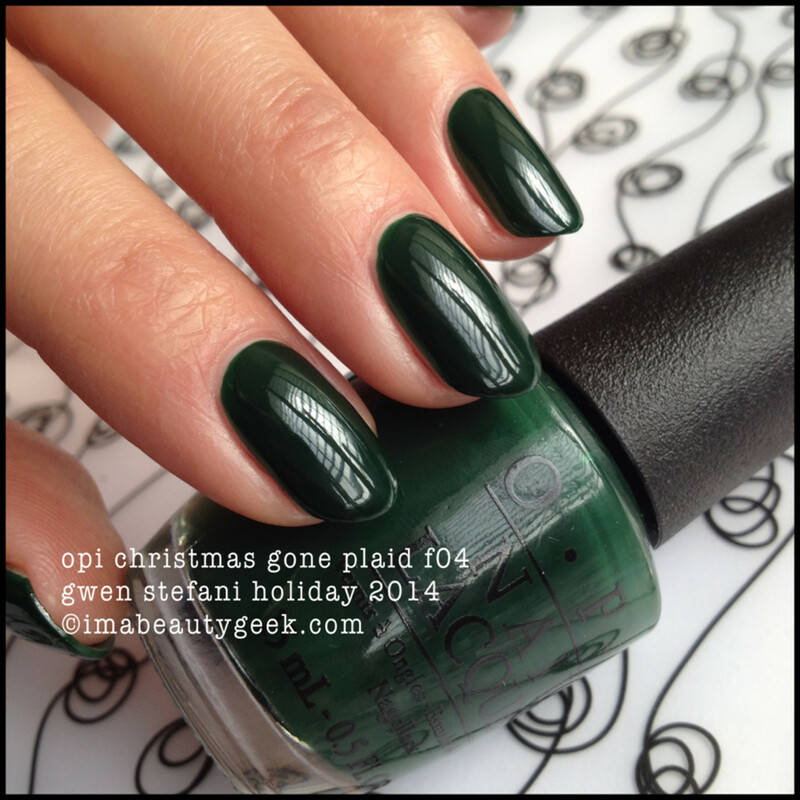 opi gwen stefani holiday 2014: kiss me – or elf! As much as I love a royal purple, I love this even more. It’s my Grabby Hands colour and it gets me every single time. From this angle, you can see there’s a light metallic shimmer along where the light hits it the polish. And from this angle, you can see the shimmer in the bottle. It translates to the nail in an oh-so-subtly alluring way. 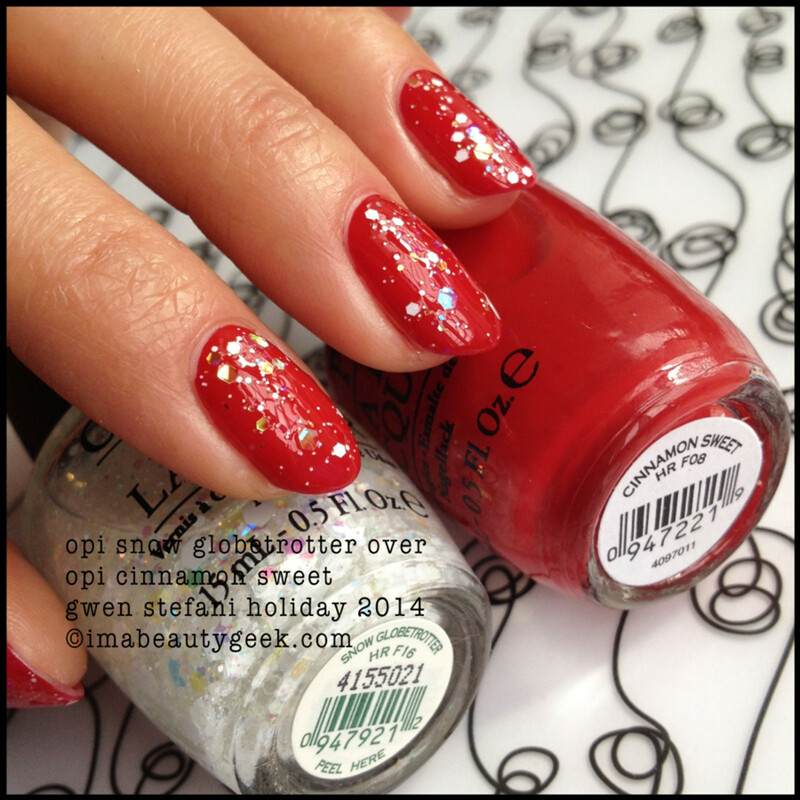 opi gwen stefani holiday 2014: snow globetrotter over kiss me – or elf! And here.. well what can I say that you can’t already see? 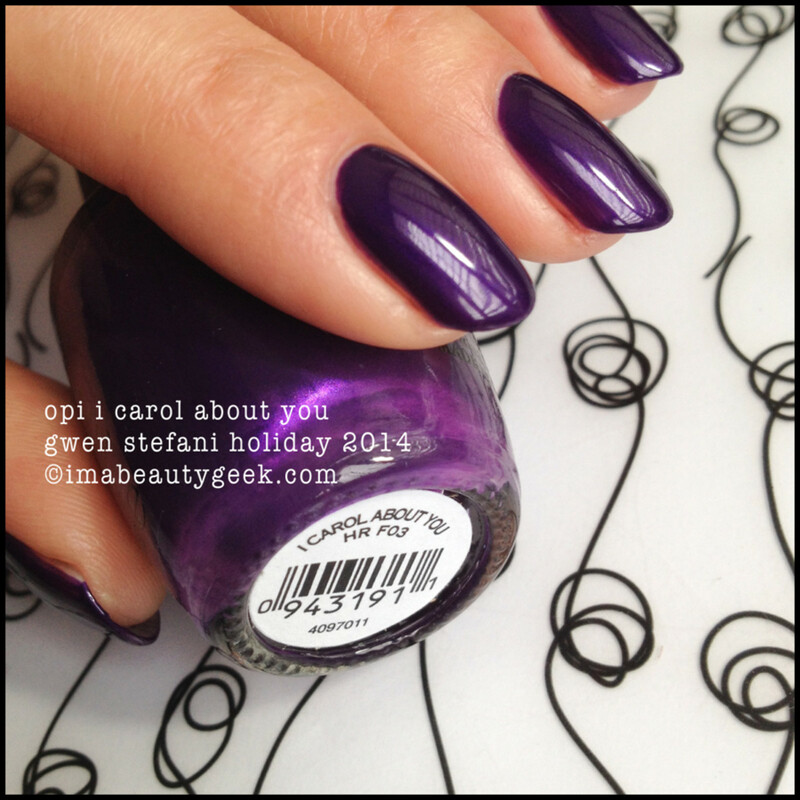 Clearcoat almost pops Kiss Me – Or Elf! as a metallic and that Snow Globetrotter with those iridescent hex glitters just makes everything into a happy holiday funtime. I don’t have words for how I feel about this. 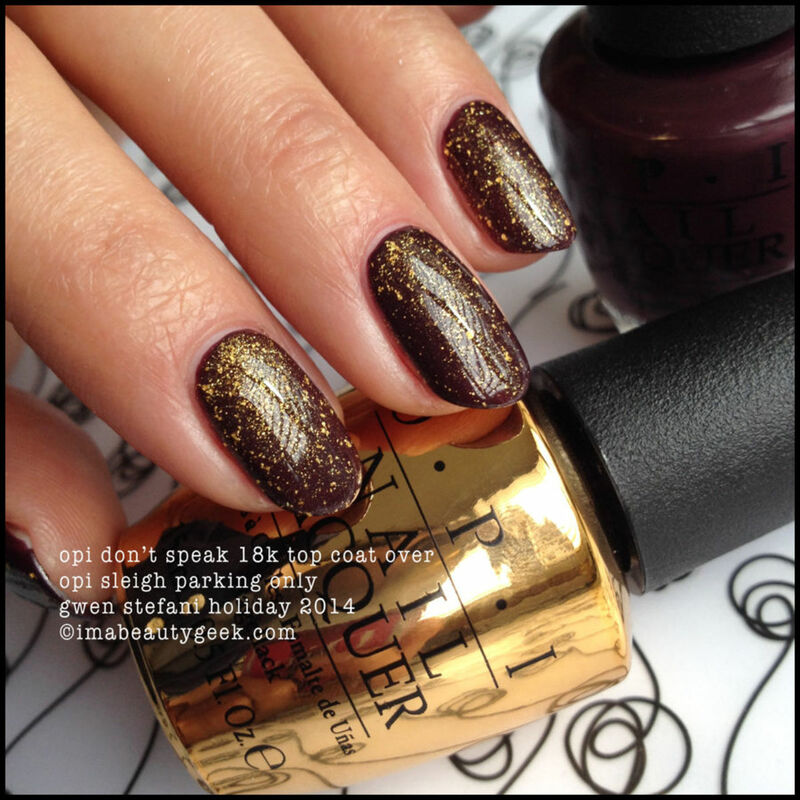 (*please note this is the 2013 top coat and not the 2014 Don&apos;t Speak 18k Gold top coat). Nope, still don’t have words. Okay, maybe I do. Gimmie That!!!!! And there you have it friends. The whole shebang in one big, blindingly picture-heavy post. This OPI Gwen Stefani collection is supposed to launch in October and luckily, it’s October. It’s on-counter all over the place in the US and in Canada ($11.50CAD), you can get it at your fave nail places online like ulta.com and nailpolishcanada.com and Trade Secrets. How many you gonna get? How many you gonna put on your wishlist? Me? Almost all. 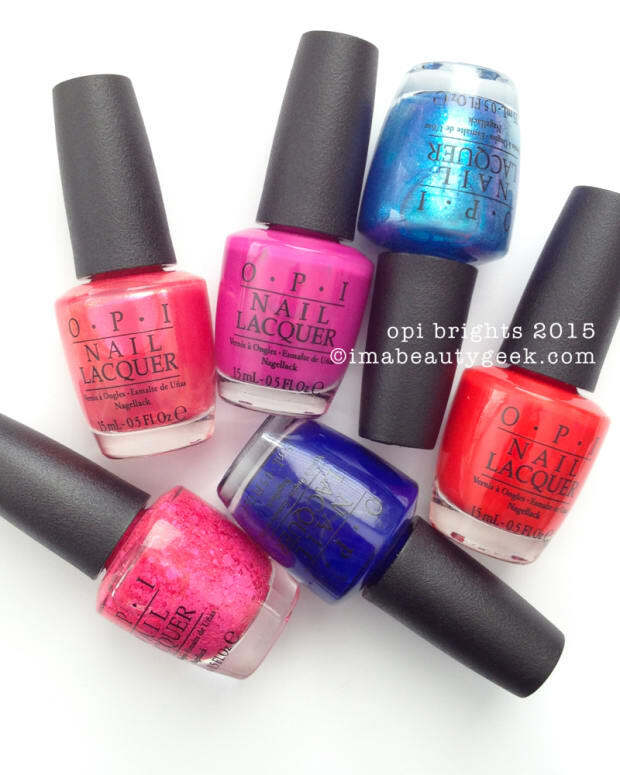 For more OPI information we invite you to visit OPI.com. 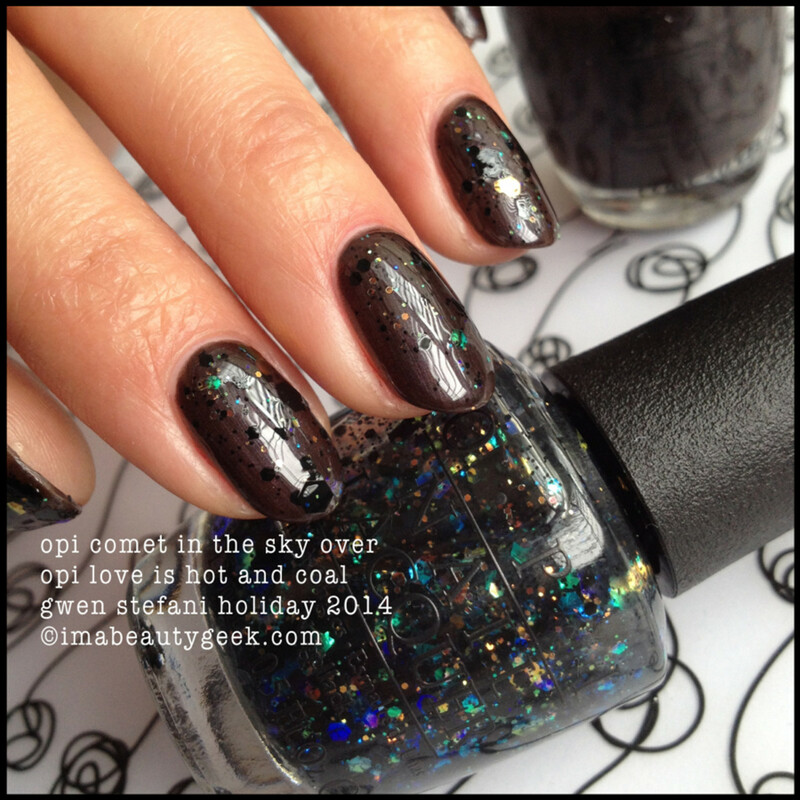 For a whole bunch of other things like OPI Nordic, OPI DS 2014, OPI Pink of Hearts for BCA, and OPI Peanuts for Halloween, just click those linky things. See ya’ll soon and thanks so much for stopping by. Your visits mean the world to me. Really.